Marina Jack in Sarasota, Fla., was chosen National Marina of the Year for 2015 in the large marina category. Marina Jack in Sarasota, Fla., is putting the finishing touches on a new branch of its business — a full-service boatyard for vessels as large as 65 feet that includes a 70-ton Travelift, dry-stack storage for 50 boats, a fuel dock, ship’s store, upgraded docks and power, and a team of seven technicians. Marina Jack bought the property, formerly Turtle Beach Marina, last September. “It’s a great location, but it needed a lot of attention — and we have given it a lot of attention, and we’re proud of what we’ve done,” says Sam Chavers Jr., Marina Jack’s director of marina operations and dockmaster. Now called Bayfront Yacht Works — “Southwest Florida’s premier marine haulout and repair facility” — the boatyard does jobs that include bottom painting, engine repair and propeller refits. Marina Jack will complete the $6 million renovation of its Bayfront operation next month. Soran saw the boatyard as an opportunity to better serve his customers. “Previously we were having to send our customers’ vessels to outside vendors for work that didn’t meet the quality level of service that our customers expected from us,” says Soran. 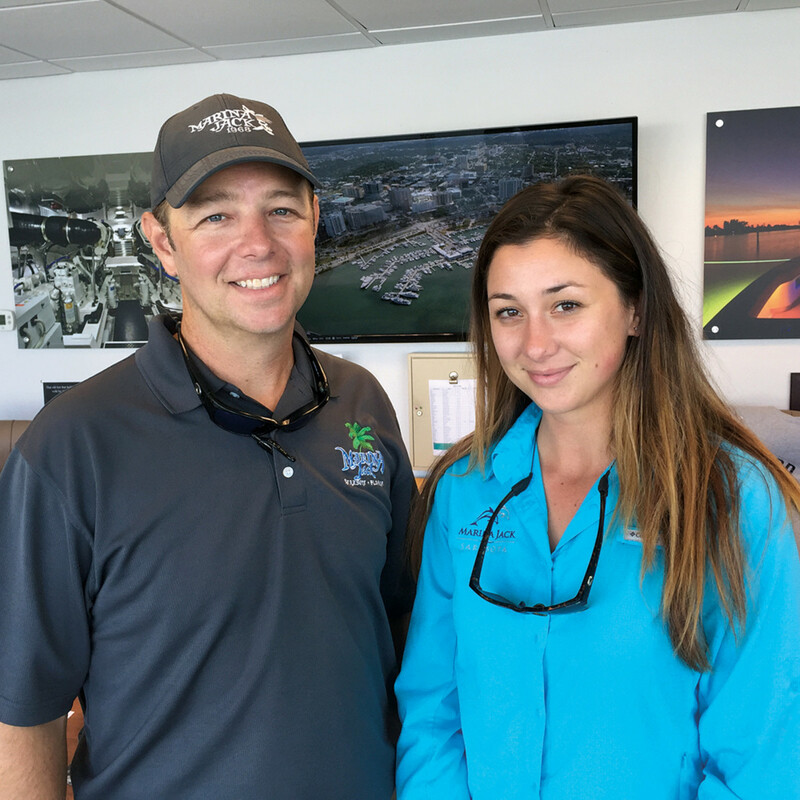 Sam Chavers Jr. is director of marina operations and dockmaster at Marina Jack and Kathryn Wilson is public communications manager and yacht services administrator. The launching of Bayfront Yacht Works comes on the heels of Marina Jack’s capturing the 2015 National Marina of the Year award, given by Marina Dock Age magazine. The accolade is awarded to one small marina with less than 250 slips and one large marina with more than 250 each year. Marina Jack was selected in the large marina category; the small marina award went to Harbour Town Yacht Basin on Hilton Head Island in South Carolina. “What struck me most about Marina Jack was how much it had changed over the last 15 years or so, continuing to evolve when many marinas were struggling with the economy,” Anna Townshend, editor of Marina Dock Age magazine, said in a statement. One of the most noteworthy public-private projects has been the Bayfront Mooring Field, which has helped to mitigate the area’s problem with derelict boats. Besides the mooring field, Chavers says the establishment of a concierge-like hospitality program for customers (Marina Jack Yacht Services) and Marina Jack’s strong role as a facilitator of Sarasota community events (such as this summer’s Fourth of July fireworks, a Christmas boat parade and fishing tournaments) helped Marina Jack earn the award. 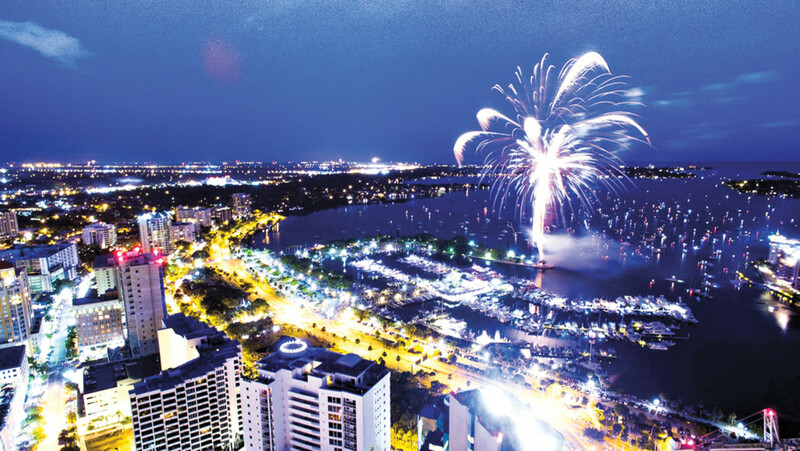 Marina Jack in Sarasota, Fla., hosts the city’s annual Fourth of July fireworks display — just one of the community activities it supports. The city of Sarasota owns the Marina Jack property. Marina Jack leases the site from Sarasota but owns, maintains and operates all of the marina facilities and services, which have grown in size and number since Soran took ownership 17 years ago. Soran owns and operates the new Bayfront Yacht Works property and business. The marina’s docks and infrastructure from about 2001 to 2008 underwent significant repairs and renovations, says Chavers. After the Great Recession, Soran began adding services, including the mooring field (2011) for 60 boats with a capacity for 109; Marina Jack Yacht Services (2012) and water sports and boat rentals; and the new Bayfront boatyard (2015). A total of $15 million has been invested in expansions and renovations since 1996. Marina operations has a staff of about 35 employees. There are 316 wet slips, including 35 for transients. The marina can hold boats as large as 228 feet. Marina Jack also has a diesel and gasoline (with non-ethanol fuel) floating fuel island, free pumpout service and two boat rental companies with a total of 10 vessels. Ten commercial vessels are also berthed at Marina Jack, including a 96-foot dinner cruise boat (Marina Jack II), two sailboats, two fishing headboats, a sightseeing boat and four private charter fishing boats. Freedom Boat Club, with 35 slips, also calls Marina Jack home. Marina Jack recently added 19 “no-profile” slips that operate with hidden hydraulic lifting mechanisms. “They’re cable-less with no superstructure — a very clean look,” says Chavers. Five dealerships have boats on site — Galati Yachts, Sarasota Yacht & Ship, MarineMax, Viage Group and Sara Bay Marina. In addition to marina operations, Marina Jack includes three restaurants with a mix of casual and upscale dining. The main restaurant employs 132. O’Leary’s Tiki Bar & Grill has a staff of 28 and welcomes pets. The mooring field, which Marina Jack operates at no profit, has had 1,200 guests since it was established, with no derelict-vessel issues. It includes free pumpout service. Ten percent of the field is reserved for transient boaters. A mooring costs $25 a night, which includes pumpout, trash pickup and Wi-Fi. The Bayfront Mooring Field is one of five pilot programs aimed at combating the derelict-vessel problem in the state, says Chavers. The key to high achievement in business is to offer a variety of services and features that will draw and retain customers, says Soran. Soran says his staff is a point of difference. “We have a woman who has been making homemade Key lime pie for 20 years, and we have a sous-chef that’s been with us for 40 years,” he says.